The Grooming Cream from label.men is a lightweight cream designed to create natural definition and control. Protein-rich liquorice root and essential oils nourish the hair and scalp, whilst reducing frizz for a smoother finish. Formulated with the exclusive eleMENts complex, which provides soothing botanicals to stimulate hair growth. 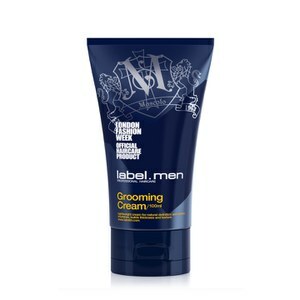 Suitable for all hair types, the cream can be used as a leave-in styling product to build texture, or can be applied to wet hair to prepare for styling. E.N. Directions for use: Apply the required amount to dry or wet hair and style as desired. The amount used will determine the level of hold and texture.